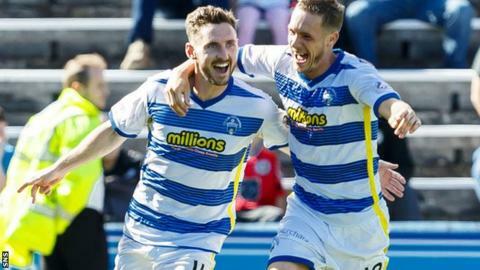 Bob McHugh was on target as Morton recovered from a poor first half to earn a point at home to Dumbarton. Sons made an excellent start and hit the front when Mark Stewart knocked the ball home at the far post from Tom Walsh's delivery. McHugh bagged his sixth goal of the season to draw his side level after good work from Jai Quitongo. Ross Forbes went close to a winner for Ton but both sides had to settle for a share of the spoils. A draw was probably the right result on a day when both sides struggled to create clear cut openings. Dimitrios Froxylias and Quitongo drew decent stops from Sons keeper Scott Gallacher in the first half as the visitors held firm. And Gallacher was at it again after the break, denying Ricki Lamie, while home keeper Derek Gaston did well to save from a Walsh free-kick. Match ends, Morton 1, Dumbarton 1. Second Half ends, Morton 1, Dumbarton 1. Sam Wardrop (Dumbarton) wins a free kick in the defensive half. Sam Wardrop (Dumbarton) wins a free kick in the attacking half. Corner, Dumbarton. Conceded by Mark Russell. Ally Roy (Dumbarton) wins a free kick in the defensive half. Foul by Mark Russell (Morton). Greg Morrison (Dumbarton) wins a free kick on the right wing. Substitution, Morton. Scott Tiffoney replaces Robert McHugh. Corner, Morton. Conceded by Andy Dowie. Attempt saved. Ross Forbes (Morton) left footed shot from outside the box is saved in the bottom left corner. Attempt missed. Jai Quitongo (Morton) right footed shot from the left side of the box is close, but misses to the right. Substitution, Dumbarton. Ally Roy replaces Mark Stewart. Substitution, Dumbarton. Calum Gallagher replaces Tom Walsh. Attempt saved. Ricki Lamie (Morton) left footed shot from the left side of the box is saved in the bottom right corner. Corner, Morton. Conceded by Sam Wardrop. Attempt blocked. Robert McHugh (Morton) right footed shot from the left side of the six yard box is blocked. Corner, Morton. Conceded by Scott Gallacher. Attempt saved. Ross Forbes (Morton) right footed shot from outside the box is saved in the bottom left corner. Attempt saved. Ross Forbes (Morton) left footed shot from very close range is saved in the top left corner. Robert McHugh (Morton) wins a free kick in the attacking half. Ricki Lamie (Morton) is shown the yellow card for hand ball. Hand ball by Ricki Lamie (Morton). Attempt saved. Tom Walsh (Dumbarton) right footed shot from very close range is saved in the top left corner. Gary Harkins (Morton) is shown the yellow card for a bad foul. Foul by Gary Harkins (Morton). Craig Barr (Dumbarton) wins a free kick in the attacking half. David Wilson (Dumbarton) wins a free kick on the right wing. Substitution, Dumbarton. Greg Morrison replaces Dimitris Froxylias. Sam Wardrop (Dumbarton) is shown the yellow card for a bad foul. Jai Quitongo (Morton) wins a free kick in the defensive half.